I tried making bagels once, a few years back, and ended up with tough, lumpy ropes of dough that went straight into the trash. I kept bookmarking bagel recipes that looked promising, and most were based on Bernard Clayton's popular recipe. Recently, with the enthusiastic support of my bagel-loving 4-year-old, I mustered up the courage to try again. Everyone's right: This is a fantastic bagel! With a little experimentation, I settled on this version incorporating a bit of white whole wheat flour and using brown rice syrup in the boiling water bath. It takes some time -- just over 2 hours, start to finish, including an hour-long rise -- but it's far easier, and tastier, than I had expected. To go with it, I literally whipped up some fresh strawberry cream cheese and set it out with butter, jam, and 20 bagels still warm from the oven. The bagels swiftly disappeared, so I guess I'll have to make more. Soon. This is based on a recipe from Bernard Clayton. Easily doubled, this makes 8 normal-size bagels or 10 smallish ones. Combine the yeast and hot water in a small bowl, stir, and let sit for a few moments until mixture is foamy. Combine flour, sugar, and salt in a large bowl. Pour in yeast mixture and blend well by hand or in a stand mixer. Set dough on a lightly floured surface and knead about 7-10 minutes, until dough is firm and satiny. Put dough into a lightly oiled bowl and cover with plastic wrap. Let rise for an hour, until doubled in size. Once dough has risen, preheat oven to 400 degrees (375 if using a convection oven). Add rice syrup to a large pot of water and bring it to a boil. 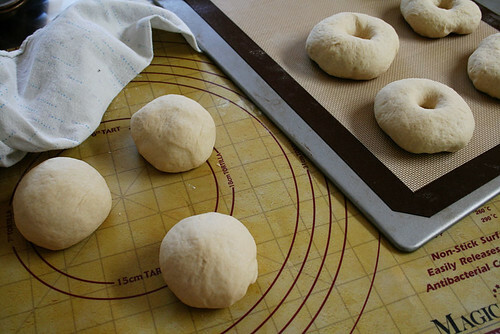 Punch down dough with your fingers and divide into 8 to 10 equal portions. Form each portion into a ball by folding it over and pressing the edges together, then gently rolling it on the table with the palm of your hand. Let rest a few minutes. Using your hand, slightly flatten each ball, poke a hole in the center with your finger, and gently shape the bagel. 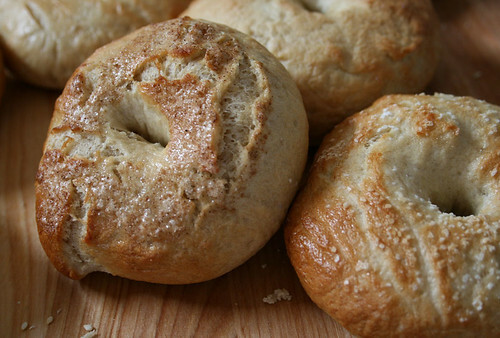 Loosely cover bagels with a kitchen towel and let them rise for 10 minutes. Lower the heat on the stove so the water-syrup mixture settles to a simmer. Working with two to three bagels at a time, gently lower bagels into the simmering water with a slotted spoon. Simmer for 45 to 60 seconds, then flip over and simmer another 15 to 30 seconds. Remove each batch of bagels from the water and set them on a kitchen towel. Pat them dry with another towel. Combine egg white and water in a small bowl, and brush mixture over each bagel. If you want to add toppings, sprinkle them on now. 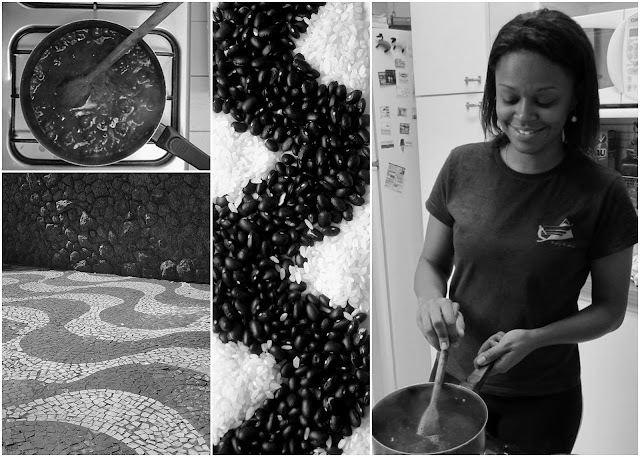 Line a baking sheet with a silpat, or lightly grease the pan and sprinkle with cornmeal. Put bagels on prepared pan and bake for 20 to 30 minutes, until golden brown. Cool on wire rack. 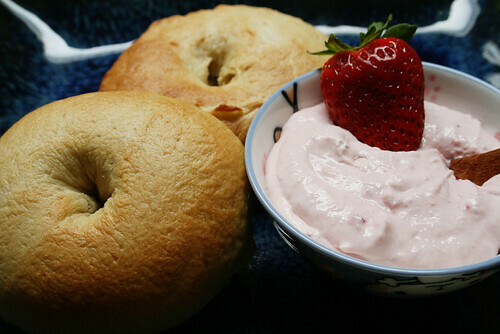 This makes a delicious, natural fruit dip or bagel spread. Puree strawberries. Stir or blend into cream cheese along with sugar. I know! I had the lowest expectations for these, but they're so satisfying that now I feel badly our favorite bagel shop won't be getting such loyal support from my family. Thanks for clear instructions and making this seem easy. Will have to try this recipe since our local bagel shop (excellent) is closed due to someone driving through the front wall!